Sri Thissapura Gunarathna Thero, an extremist Sinhala Buddhist monk, who has been constructing a controversial Buddhist vihara establishment at the private lands of Eezham Tamils in the strategic Kokku'laay, which links the Northern and Eastern provinces, has put up another Buddhist stupa at the locality in recent weeks, Tamil officials at Karai-thu'raip-pattu division said. The monk is fully assisted by Sinhala soldiers who are deployed in civil clothes. Despite repeated complaints and interim orders coming from local and provincial authorities, the monk is continuing the construction with the backing of Colombo government, occupying Sinhala military and the extremist Buddhist Power Force (BBS). Mr Manivannathas, the Tamil owner of the land has once again sought help from the public to stop the construction work, but says no-one is coming forward to take up his case. Gunarathna Thero has also seized portions of public lands that belong to the post office and the base hospital at the site, according to officials at the District Secretariat of Mullaiththeevu. Lands of Hindu temple and a public road have also been absorbed into the Buddhist establishment, Tamil villagers say. 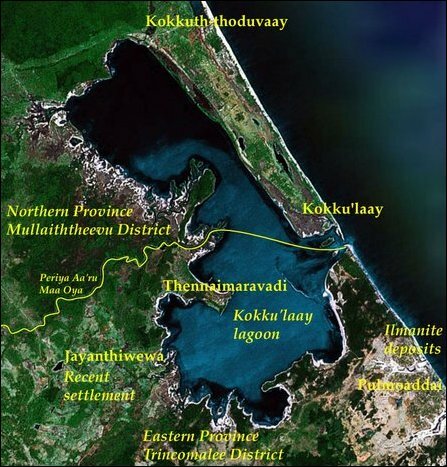 The area surrounding Kokku'laay has been the focus area of Sinhala colonisation in Mullaiththeevu district, as it is the key location for wedging the demographic contiguity of the North and East. Kokku'laay is a traditional Tamil fishing hamlet. In 1970s, only two Sinhala fishing operators used to come here with a 15-member workforce on seasonal fishing. All of them were Catholics except two members who were Buddhists. Since then the demography of the village has been changing slowly. Migrant Sinhala fishermen from Negombo and other coastal villages of the Western Province were officially encouraged to engage in fishing in this eastern coastal lagoon of Kokku'laay, which is famous for prawn. Tamil villagers were uprooted following the 1983 anti-Tamil pogroms. A small Buddha statue was placed after the Tamils were fully evicted from their village. All of the Tamil people had displaced by 1985. During the times of the war, the area was occupied by the SL military and was declared as a military High Security Zone. However, due to the presence of the LTTE, Colombo was prevented from Sinhalicising the link during the 30-year-long armed struggle. After the end of genocidal onslaught on Vanni in May 2009, Sinhalicisation was intensified through the land link from the neighbouring Sinhala colony of Padaviya in Anuradhapura district and Ma'nalaa'ru (Weli-oya) division in Vavuniyaa district.